Today, he is primarily remembered for the following compositions: Aberystwyth, Myfanwy, Blodwen, Cytgan y Pererinion (The Pilgrims' Chorus), Cytgan y Morwyr (The Sailors' Chorus). Parry's music suffered a decline during the 20th century. Parry's 'best seller' was undoubtedly Hywel a[and] Blodwen, a short, comic love duet from Act 2 of Blodwen - the first Welsh opera. Composed in 1876-77 on a libretto by 'Mynyddog' (Richard Davies from Cemaes) and first performed in 1878 in Aberystwyth, the opera took Wales by storm. Hywel a Blodwen remains a favorite concert item. 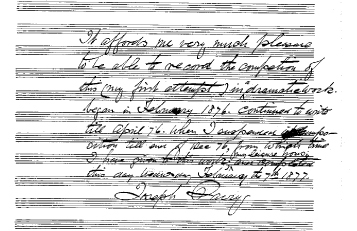 This holograph document (left) clarifies the uncertainty surrounding the date of composition: "It affords me very much pleasure to be able to record the comp[l]etion of this (my first attempt) in a dramatic work began in February 1876, continued to write till April 76. When I suspended composition till end of Dec 76, from which time I have given this work my leisure hours, and completed this day Wednesday, February the 7th 1877. Joseph Parry"
Recently Published Parry works at Ty Cerdd. The first public performance took place some 15 months later on 21 May 1878, Parry's 37th birthday. The cast consisted, for the most part, of Parry's students and the accompaniment was a piano, played by the composer's sons, 13 year old Joseph Haydn Parry and at the harmonium, 12 year old David Mendelssohn Parry. The performance took place in the Temperance Hall on North Parade, Aberystwyth, the venue for many concerts in the 1870s but long since demolished. Few people in Aberystwyth, or even in Wales, would have seen an operatic performance before or known what to expect. Furthermore, the non-conformist churches, particularly those in Wales, disapproved strongly of stage performances and regarded theatres as morally equivalent to alehouses and brothels. (Over the next 20 years, Blodwen contributed greatly towards changing these attitudes.) Nevertheless, the hall was packed and the audience enthusiastic. Parry therefore felt it necessary to address the audience, prior to the start of the performance, explaining what an opera was and emphasizing that the singers, though in costume, would not be ‘acting'. Despite an improbable and historically inaccurate plot, derivative and stylistically eclectic music, amateur performers and static staging, the performance was a resounding success and, by the end of the 19th century, it there had been over 500 performances in Wales as well as a good number in those parts of the United States where there had been significant Welsh immigration. Although its popularity declined during the 20th century, some of the numbers from the work continue to be sung at eisteddfodau and concerts in Wales. In 1978, Gwyl Gerdd Menai (the Menai Bridge Music Festival), now sadly defunct, decided to commemorate the centenary of the première with a concert performance with full orchestra, which was broadcast live on BBC Radio and subsequently released as a CD by the Welsh recording company Sain and other online music retailers. The festival's then director John Hywel of Bangor University's Music Department, had asked Dulais Rhys, a former music student at Bangor, who was working on Parry for his PhD, to investigate the feasibility of using Parry's original orchestral score for this performance. The orchestral score existed only in manuscript and was housed, as are almost all of Parry's manuscripts, in the National Library of Wales, Aberystwyth. Unfortunately, the composer's orchestration left much to be desired, largely because of the very limited orchestral resources available for the 19th century productions. Rhys therefore created a new orchestral version, based on Parry's original work, and it was this version that was used for the centenary performance. Rhys is currently (2015) working on a chamber orchestration of the Blodwen accompaniment – a new edition that will also include a phonetic equivalent alongside the original Welsh libretto. A copy of the published vocal score can be viewed on the imslp.org website. 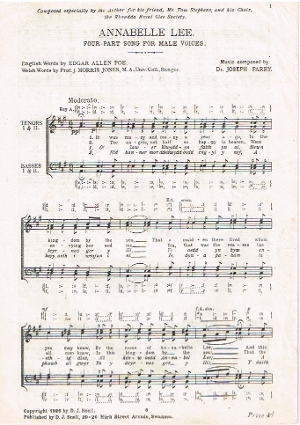 This website also contains other examples of Parry's music. Despite its shortcomings, Joseph Parry's Blodwen contains music of quality, beauty and dramatic effectiveness. The opera remains an historic milestone in the history of Welsh music and its composer is still remembered and revered as Wales's most famous 19th century musician. A contemporary review of the first performance of Blodwen appeared in the Aberystwyth Observer which is reproduced on the Articles page of this website. Most of these familiar pieces date from a relatively narrow period in Parry's career. His later compositions are generally of a higher standard but are almost never heard today: for example, Annabelle Lee (1898), a setting for Male Voices of Edgar Allan Poe's famous poem. The first page of this work, published in 1926 by D. J. Snell, Abertawe/Swansea is seen here. A new edition of Annabel Lee (Poe's orgiinal spelling), edited by Dulais Rhys, will be published soon.